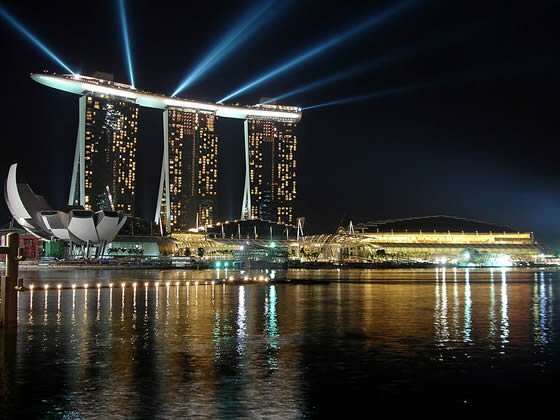 Top 5 beautiful places in Singapore. 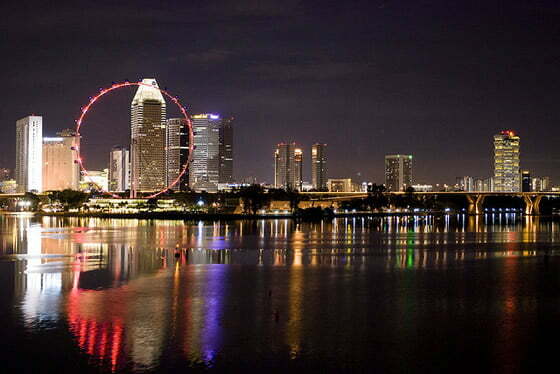 Singapore Flyer, described by its operators as “Flyer Observation Wheel”, was the tallest ferris wheel in the world from 2008 until 2014. Standing at a stunning 165m (541 ft.) from the ground, near the shore of Marina Bay, it is 5 m (16 ft.) taller than the Star of Nanchang, in China and 30 m (98 ft.) taller than the London Eye, in England. It is built over immense three-storey complex with restaurants, shopping, and bars. The Flyer is mounted with 28 air-conditioned capsules, each one the size of a bus, capable of holding 28 passengers. The scenic flight on the Flyer offers you breathtaking 360° views of Singapore’s center and beyond to about 45 km (28 mi), including glimpses of the neighboring countries of Indonesia and Malaysia. This ferris wheel rotates slowly and the ride lasts approximately 30 minutes. 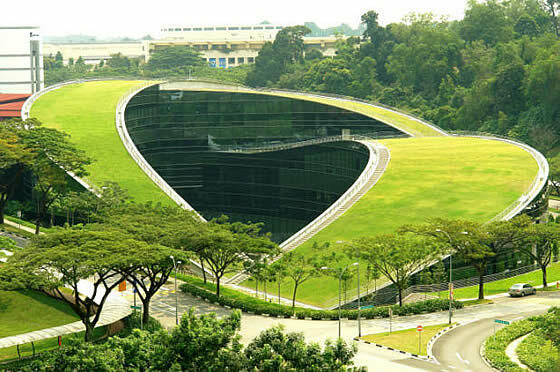 The School of Art, Design and Media at Nanyang Technological University in Singapore has an amazing curving green roof structure, with an organic, vegetated form that blends nature and high-tech and symbolizes the creativity it houses. The open roofs serve as informal gathering spaces; insulate the building and harvest rainwater for landscaping irrigation. The glass façade reduces solar gain, while allows natural views of the surrounding foliage. Gardens by the Bay is a surreal green oasis in the heart of Singapore that offers an easy getaway from the city centre traffic and skyscrapers. This horticultural heaven brings plants to life in a way you have never seen before. There you are surrounded by nature whilst feeling like you have stepped into the Avatar movie. 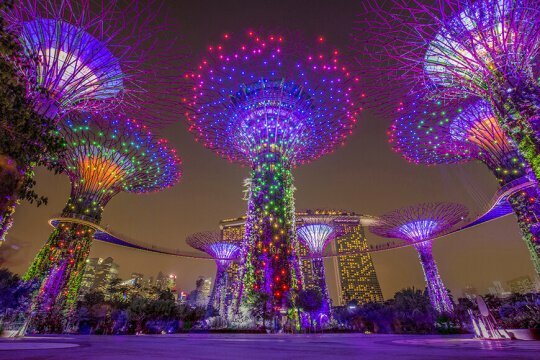 This huge, colorful, futuristic park is famous for its high-tech Supertree Grove – a collection of magical giant trees – as well as Cloud Forest and Flower Dome – the world’s largest climate-controlled greenhouses. The garden complex is also home to several outdoor gardens and lakes, such as the scenic Dragonfly & Kingfisher Lakes. Gardens By The Bay is indubitably a unique attraction many nature-lovers and photographers would look forward to visit. It is located adjacent to Marina Bay Sands, which offers a fantastic aerial view of the entire garden form its Marina Bay Sands Skypark Observation Deck. 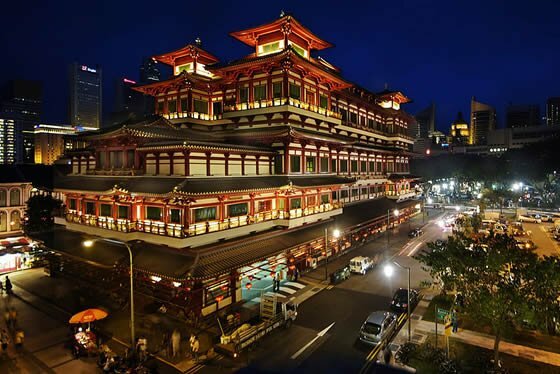 TThe Buddha Tooth Relic Temple and Museum is a four-storey Buddhist temple and museum complex that rises up at the heart of the Chinatown district in Singapore. The temple is based on the Tang dynasty architectural style and built to house the tooth relic of the historical Buddha, which is claimed that was found in 1980 in a collapsed stupa in Myanmar. From outside the temple is grand, inside it is richly ornate and colorful, but the most significant feature of the temple is the two-meter tall solid gold stupa that weighs 420 kg located at the top floor, in the Sacred Light Hall. It is the Sacred Buddha Tooth Relic Chamber, which is the repository of the sacred Buddha tooth. The magnificent Marina Bay Sands is an integrated resort fronting Marina Bay that offers a luxury 2,561-room hotel, an art convention and exhibition center, the Shoppes Mall, an Art & Science museum, two Sands Theatres, seven “celebrity chef” restaurants, two floating pavilions, a nightclub, lounges and a casino with 500 tables and 1,600 slot machines. The three hotel towers are connected by a 340 meter-long sky terrace on the roof that resembles a ship named Sands SkyPark, . The Skypark is home to restaurants, lush tropical trees and plants and an observation deck, but its highlight is the longest elevated swimming pool in the world, a 150-meter (478-ft.) infinity edged pool, which stands 191 meters from the ground on the 56th floor of the complex building. But do not get too excited, the pool is for exclusive use of the luxury hotel guests.